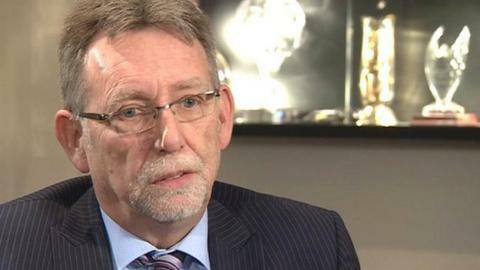 Ray Trew has stepped down as chairman of Notts County and has announced that the League Two club is for sale. Trew became owner and chairman in 2010 but said he made the decision after his family were subjected to "foul and mindless abuse" in recent days. Notts, who appointed Jamie Fullarton as manager in January, are 16th in League Two having been relegated last season. BBC Radio Nottingham reports local businessman Alan Hardy is in talks to buy the club. "It is with very mixed emotions that I announce the end of my tenure," Trew wrote in an open letter to fans. "This is not me backing away from a challenge, I do not do that and, indeed, if I'd have wanted to I would have done so some time ago because it has been a difficult journey at times. "However, when my family are subjected to the kind of foul, mindless abuse that they have been in recent days, both in person and courtesy of the oh so brave keyboard warriors, regardless of whether this is just the minority ruining it for the larger supporter base, I have to make changes." Trew paid £1 to buy the Magpies from then chairman Peter Trembling six years ago and took on debts of more than £1.5m, which were built up during Munto Finance's brief period as owners. Despite initial success, with the club winning the League Two title at the end of Trew's first season, Notts have had nine full-time managers during his time. Trembling bought Notts from Munto Finance for a nominal fee, only five months after the Middle Eastern consortium took over at Meadow Lane. "Given the events of the weekend and the apparent confrontation Aileen Trew had with a group of fans - and the feeling around the place - it's not an absolute shock. "I know what can go on online. And if the Trews feel it has been serious enough, and face-to-face abuse as well, that that they have to step away from it then that is most unfortunate. You don't want anyone to come under such fire and vitriol. "Initially it will undermine the club and make it unstable because it is a period of uncertainty. Hopefully there will be buyers lined up. "Ray Trew leaves the club with the infrastructure in better shape than when he took over; you have to be thankful for what has has done. "Notts are a great club in a great city and are a great prospect for somebody to get hold of and progress them on and off the pitch."